In Côte d’Ivoire, I once met a boy working on a cocoa farm whose only dream was someday to taste the rich brown chocolate he helped produce. And in Pakistan, I once rescued a boy who sewed footballs and wished only to play with the product of his work. To that end, Norwegian Prime Minister Erna Solberg, Chilean President Michelle Bachelet , Indonesian President Joko Widodo, Malawian President Peter Mutharika, and UNESCO Director-General Irina Bokova have convened the International Commission on Financing Global Education Opportunity. Currently, millions of children are being denied quality education, and 263 million children are out of school worldwide – including 63 million in conflict zones and another 30 million who have disabilities. Millions cannot go to school because they are trapped in child labor and slavery, fueling a lifelong cycle of poverty and illiteracy. Poor children who are forced to perform unskilled repetitive tasks fail to learn anything else, which erodes their future employability and puts them on a path toward continued hardship in adulthood. Only education can stop this cycle and give children the means to secure a future free from exploitation. Meanwhile, 600 million children who are in school are missing out on the full benefits of education because they are not learning basic skills. Young people who haven’t learned the skills they need to participate in the global economy are becoming disillusioned , which makes them more likely to find outlets in extremism or crime. These numbers tell a story of education in crisis. But it’s worth mentioning that in 2000 the total number of out-of-school children was almost one-quarter higher, at 374 million, than it is today. This improvement proves that we can still build a better, more equitable, and sustainable world through education. Fortunately, many countries are now implementing sound policies to do just that, including abolishing school fees, starting school meal programs, and using cash transfers to provide educational opportunities in poor communities. Moreover, at the international level, the fourth UN Sustainable Development Goal encapsulates a new commitment by member countries to ensure inclusive, quality education and lifelong learning opportunities for all people by 2030. SDG 4 is ambitious, but achieving it is imperative if the world is to meet the other 16 SDGs. The Education Commission’s new report, “The Learning Generation: Investing in Education for a Changing World,” recommends a targeted approach and greater investment aimed at the hardest-to-reach children – those who are in child labor, suffering from disabilities, affected by conflicts, or excluded from education simply because they are girls. The Education Commission proposes a strategy that fosters empathetic, compassionate, and respectful youth leaders who can show their peers that peace and innovation are worthy alternatives to fundamentalism and extremism. 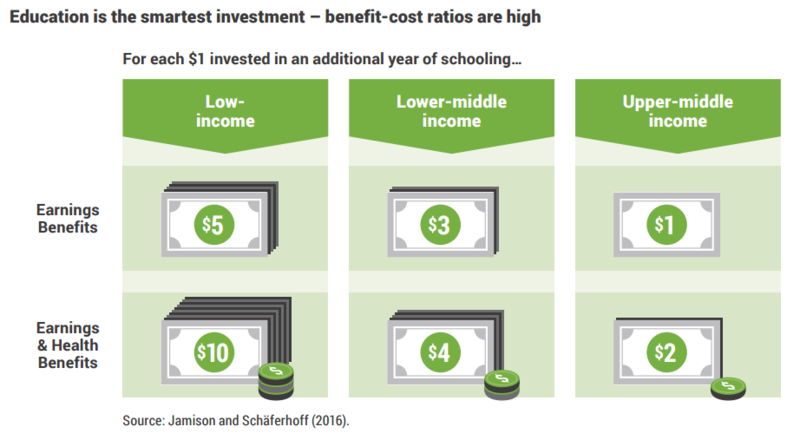 And, because education is ultimately a public good furnished by states, we advise governments to increase their investment in schools, either with domestic resources, international support, or private-sector partnerships. The Education Commission’s report was presented to UN Secretary-General Ban Ki-moon at this month’s UN General Assembly summit, and we hope that world leaders will take notice and begin to translate its recommendations into action. A childhood without education isn’t a childhood at all, and every youth who is out of school is one too many. We must act urgently to provide universal primary education by 2030. Creating a “learning generation” is a moral responsibility we all share – and a legacy all subsequent generations will carry on if we can just take the first, crucial steps.